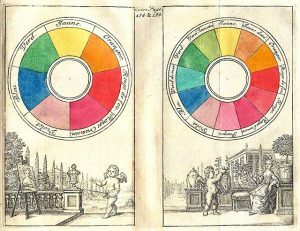 Since 1666 when Sir Isaac Newton developed the color wheel, this visual resource has been revisited, updated and used by artists to represent the various hues derived from the primary colors. Over time, information and knowledge about how colors evoke emotion and subtly influence the thinking of the viewer has increased. In particular, the categorization of warm and cool colors has lead to a deeper understanding of the psychological effects that various hues can induce. 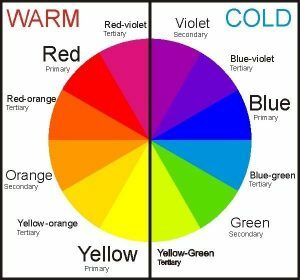 Colors are categorized as warm and cool according to their placement on the color wheel. A color wheel is designed around the three primary colors. Red, blue, and yellow sit on opposite sides of the wheel. The combinations of each pair of these colors form the secondary colors of purple, green and orange. The tertiary colors, which fill out the rest of the wheel, are mixtures of primary and secondary colors. The colors on the right side of the wheel are considered warm colors. These hues include shades of red, yellow, and orange, and have the longest wavelengths on the color spectrum. Warm colors advance toward the eye, while cool colors recede. Cool colors on the left side of the circle, including green, blue and violet, have shorter wavelengths. Warm and cool colors are categorized as warm and cool due to the feelings that one gets when looking at the hues. Reds, yellows, and oranges are evocative of the sun and fire. Therefore, they tend to convey a sense of warmth and comfort. Cool colors, on the other hand, are reminiscent of earthy objects, such as grass and water. These hues often feel cool and refreshing, much like the outdoor areas that they are associated with. Incorporating a mix of warm and cool colors will provide a balance and a more defined contrast between the different hues. Both warm and cool colors impact our visual perception of the objects that we see. For example, warm colors will feel inviting and comforting, and provide the illusion of heat and warmth. Since these colors advance toward the eye, they work well in large spaces in order to make them feel cozy and secure. Warm colors can also be stimulating. They often evoke strong emotions and promote activity, so these colors are ideal for gyms and living rooms. Advertisers often use warm colors to provide a sense of urgency, such as with red clearance signs, as well as optimism and cheerfulness. Cool colors have nearly the opposite effects of warm colors. Receding from the eye, cool colors can make a space feel larger and more open. These hues work well in smaller rooms in order to increase the perceived size of the area. Additionally, cool colors provide a sense of calm and relaxation. They are ideal for small spaces that are intended to be tranquil, such as bathrooms and bedrooms. Cool colors also influence people by evoking a sense of health, tranquility and wisdom. Blue, purple and green are utilized in advertising to convey trustworthiness and respect. It is important to pay attention to the characteristics of warm and cool colors when choosing hues to use for a space or project. The colors that you select can influence your perspective and emotions, as well as those around you. Be sure to choose warm and cool hues that represent the type of room or message that you are trying to convey.